Engine Timing Belt Kit with Water Pump-Water Pump Kit w/Seals DAYCO WP257K3AS. Country of Origin (Primary) : CN. Harmonized Tariff Code (Schedule B) : 8413309000. Interchange Part Number : TCKWP257A, PP257LK4, PP257LK2. Life Cycle Status Code : 2. Product Description - Long - 80 : WATER PUMP KIT WITH SEALS, DAYCO. Product Description - Short - 20 : WATER PUMP KIT. See Item Specifics section for additional specifications about this part. To confirm that this part fits your vehicle, enter your vehicle's Year, Make, Model, Trim and Engine in the Compatibility Table. Also review the notes section in the compatibility chart for additional specifications about this part. This part generally fits Lexus, Toyota vehicles and includes models such as Camry, ES300, ES330, Highlander, RX330, RX400h, Sienna, Solara with the trims of Base Sedan 4-Door, Base Sport Utility 4-Door, CE Mini Cargo Van 5-Door, CE Mini Passenger Van 4-Door, CE Mini Passenger Van 5-Door, Hybrid Limited Sport Utility 4-Door, Hybrid Sport Utility 4-Door, LE Mini Passenger Van 4-Door, LE Mini Passenger Van 5-Door, LE Sedan 4-Door, Limited Mini Passenger Van 4-Door, Limited Sport Utility 4-Door, SE Convertible 2-Door, SE Coupe 2-Door, SE Sedan 4-Door, SE Sport Coupe 2-Door, SLE Convertible 2-Door, SLE Coupe 2-Door, Sport Convertible 2-Door, Sport Coupe 2-Door, Sport Sport Utility 4-Door, XLE Limited Mini Passenger Van 4-Door, XLE Limited Mini Passenger Van 5-Door, XLE Mini Passenger Van 4-Door, XLE Mini Passenger Van 5-Door, XLE Sedan 4-Door. The engine types may include 3.0L 2995CC V6 GAS DOHC Naturally Aspirated, 3.3L 3300CC 202Cu. V6 ELECTRIC/GAS DOHC Naturally Aspirated, 3.3L 3300CC 202Cu. V6 GAS DOHC Naturally Aspirated, 3.3L 3300CC V6 GAS DOHC Naturally Aspirated. This part fits vehicles made in the following years 2001, 2002, 2003, 2004, 2005, 2006, 2007, 2008, 2009, 2010. This item may interchange to the following part numbers from other brands. Brands: CARQUEST/GATES, CONTITECH, CRP/CONTITECH (INCHES), CRP/CONTITECH (METRIC-FULL), CRP/CONTITECH (METRIC-IMPORT), GATES, GATES CANADA Part Numbers: PP257LK2, PP257LK4, TCKWP257A. We at PartsMonkey are proud Canadians and are proud to serve our fellow Canadians. Our exceptional relationship with our suppliers allows us to source any parts you may require within a small time window. Given our easy and convenient quote option, we make it possible to locate those hard to find products. We hope you enjoy your experience with us and thank you for shopping at PartsMonkey. Once the product is received, it will be inspected to ensure the original packaging has not been damaged, no parts or hardware are missing, all installation instructions are present, the part is not damaged or disassembled, and no evidence is present of the product being installed and removed, then a credit will be issued. , Special order products, Promotional or discontinued products. Please note that we will not cover any labour claims against defective products. If the product is defective then we will do our best effort to have a replacement part sent out in a timely manner or issue a credit for the product. Portions of the part information on this page have been provided by WHI Solutions, Inc. 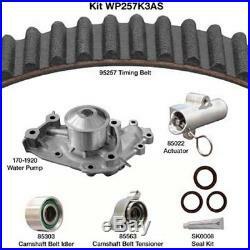 The item "Engine Timing Belt Kit with Water Pump-Water Pump Kit withSeals DAYCO WP257K3AS" is in sale since Friday, April 14, 2017. This item is in the category "Automotive\Parts & Accessories\Car & Truck Parts\Engines & Components\Timing Components".